The 2015 fishing season begins today, May 1, and stricter – but necessary – quotas on Gulf of Maine cod will take effect. Last year, scientists determined that the population of spawning cod had plummeted to historic lows (3 to 4 percent of the target level). In response, the New England Fishery Management Council voted to reduce the 2015 total allowable catch (TAC) of Gulf of Maine cod from 1,550 to 386 metric tons – a 75% reduction from the 2014 fishing year TAC. Possession of recreational-caught Gulf of Maine cod will also be entirely prohibited in the 2015 season. These new measures, as well as changes to Gulf of Maine closed areas and catch limits for winter founder and haddock are implemented through Framework 53 Adjustment to the Northeast Multispecies Fishery Management Plan. NOAA approved Framework 53 last week with the expectation that catch limits may be adjusted following the Gulf of Maine cod stock assessment, which is scheduled for September 2015. For now, the new Gulf of Maine cod catch limits replace the emergency regulations imposed by NOAA last fall. Many Gulf of Maine commercial fishermen who harvest groundfish are concerned about the new limits knowing that they will face a difficult fishing year. As AP reporter Patrick Whittle describes, cod are a “choke species.” Fishing for other groundfish species such has haddock or pollock without catching cod poses a near-impossible challenge for fishermen, and the limits on cod will likely affect these other fisheries and their respective markets. The new measures, though strict, are more than needed for the future of New England’s iconic species. In fact, they continue to represent a high risk management approach. Scientists indicated that the total allowable catch for Gulf of Maine cod should be limited to 200 metric tons – almost 50% below the new quota limits. They also warned that even such low limits may still be insufficient to allow coastal cod populations to recover. Cod is in crisis, driven by historic overfishing and compounded by new ecological changes associated with greenhouse gas emissions. Low cod catches are necessary, but they are not enough. 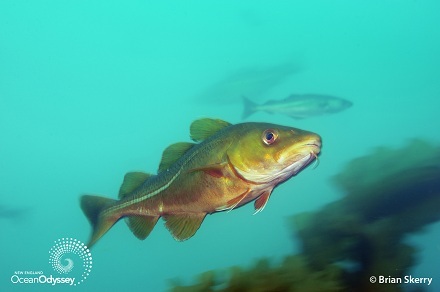 In addition to tight catch regulations, protecting the cod’s essential marine habitat, such as the Cashes Ledge Closed Area and the Western Gulf of Maine Closed Area, will be vital to the cod’s recovery, as well as the health of other species. To thrive, fish need areas where they can spawn, feed, grow, and find shelter without the threat and disturbance of fishing and fishing gear impacts. Cod fishing was America’s first colonial industry. Will it also follow the path of the Atlantic halibut fishery into commercial oblivion? As of now, 400 years later, there is little doubt that unless cod catches are reduced to as close to zero as possible, a cod fishery will move out of the region’s reach for decades, if not more. Cod’s future in New England, after decades of overfishing and risky management, is sadly now anyone’s guess.